A second South Korea-US working-group meeting on North Korea issues will be held Friday in Seoul, Seoul’s Foreign Ministry said Tuesday, amid stalled denuclearization talks between North Korea and the US. 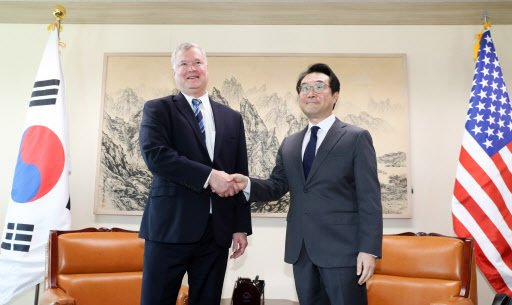 Lee Do-hoon, South Korea’s special representative for Korean Peninsula peace and security affairs, and his US counterpart Stephen Biegun are scheduled to hold a one-on-one meeting Thursday and to host a working-group meeting Friday. Biegun is set to be in South Korea from Wednesday through Saturday. The nuclear envoys are expected to discuss recent developments on contact between North Korea and the US, the allies’ strategy to deal with North Korea next year, ways to achieve progress on denuclearization and a peace regime as well as inter-Korean relations, according to the ministry. The second meeting of the South Korea-US working group aimed at better coordinating the allies’ North Korea policy will be attended by officials from the White House and South Korea’s presidential office and Ministry of Unification. Through the two sessions, the participants will discuss issues regarding the prolonged deadlock in denuclearization talks between the US and North Korea, as well as sanctions exemptions for a groundbreaking ceremony to reconnect and modernize cross-border railways and roads. The two Koreas plan to hold the ceremony at Panmun Station in the North’s border town of Kaesong on Dec. 26, amid concerns the project could undermine international sanctions imposed on the communist state. “The groundbreaking ceremony in itself is not a problem, but the shipment of equipment and materials (needed for the ceremony) could be linked to sanctions against North Korea, so we are holding consultations,” said an official from the Foreign Ministry.